In this post we will show you how to create of Buffers in Nodejs. Buffers are instances of the Buffer class in nodejs, which are nothing but data in the form of binary data similar to an array. According to Nodejs.org we should use buffers because nodejs servers not only run on browsers but also uses TCP streams and reading and writing to the file system. For TCP streams and reading and writing to the file system it is mandatory to use pure binary streams of data. Buffer is nothing but an array of integers which cannot be re-sized. It is a global object which means that you need not have to write require('buffer') for using it. //where string is the given string, [offset] is from where you will start writing, [length] is the number of bytes to write, [encoding] is the encoding to use. This function will return the number of octets written. 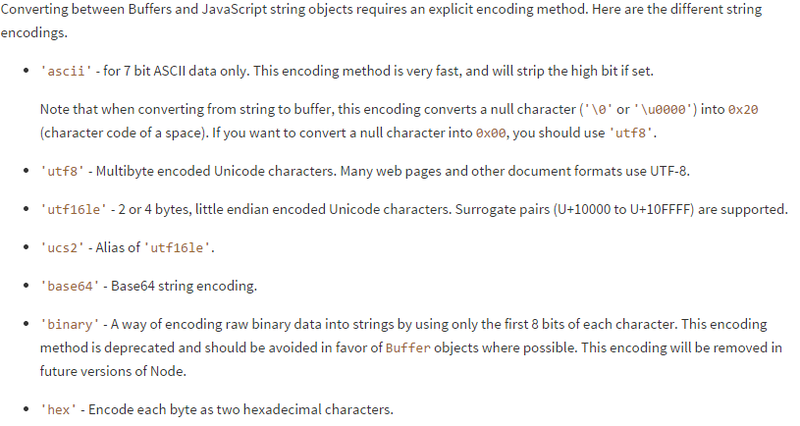 //where [encoding] is the encoding to use, [start] states from where to start, [end] states where to end. This function will return a string.